Salivary Gland Calculi; Salivary Calculi; Submandibular Duct Calculi. Sialolithiasis is the formation of calculi or sialoliths in the salivary gland. It is the most common benign condition of the salivary gland. Sialolithiasis can occur in all salivary glands. The submandibular gland is most commonly affected followed by the parotid gland. Calculi commonly measure less than 10 mm. Calculi of more than 15 mm are termed giant salivary gland calculi and are infrequently reported in the literature. Here, we report a case of unusually large submandibular gland calculus of 5 cm in greatest dimension which caused erosion of the oral cavity. 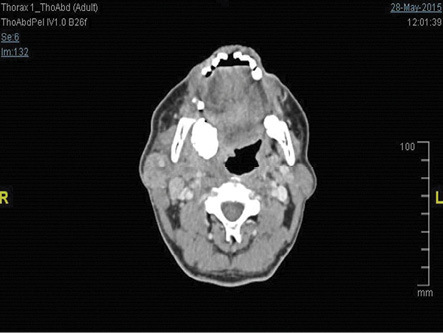 A 59-year-old male presented with complaints of right submandibular swelling, which was static in size over the past 10 years. The swelling did not cause any bothersome symptoms until two weeks prior to his presentation. The swelling increased in size rapidly causing discomfort and pain. He was also aware of a firm mass in his oral cavity for the past five years. Clinically, there was a visible huge swelling of the right submandibular region, which was tender and fluctuated on palpation [Figure 1]. Intraoral examination revealed the presence of a hard mass over the right retromolar area which eroded the oral cavity mucosa. Orthopantomogram showed a huge, irregular radio-opaque calculus over the right submandibular area. On computed tomography (CT), there was a dense calcification seen in the right neck region measuring 4.4 × 4.5 × 6.0 cm with surrounding loculated collection. The normal right submandibular gland was not visualized [Figure 2]. These findings were suggestive of a submandibular salivary gland calculus with surrounding abscess formation. The patient underwent surgical removal of the calculus and drainage of the abscess under general anesthesia. The calculus was removed via an intraoral approach [Figure 3]. The calculus was brownish in color with an irregular shape and hard surface. The greatest dimension of the calculus measured 5 cm [Figure 4]. His postoperative recovery was uneventful. During subsequent follow-up, there was a slight reduction in the size of the submandibular swelling which became painless. The patient is scheduled for right submandibulectomy. Figure 1: Visible swelling over the right submandibular region. Figure 2: Computed tomography showed a dense calcification in the right neck region. 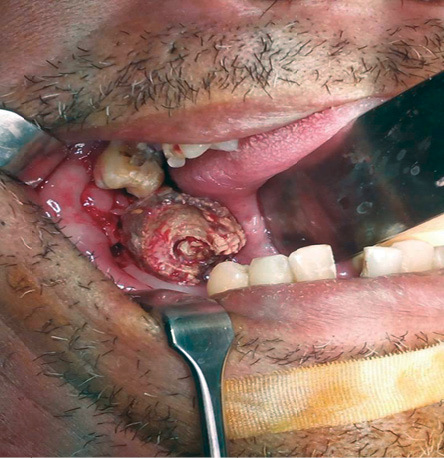 Figure 3: Intraoral removal of the calculus. Figure 4: Brownish, irregular-shaped calculus with the greatest diameter of 5 cm. The exact etiology of sialolithiasis is uncertain. Salivary stasis, ductal inflammation, and injury are important inciting processes for sialolithiasis.6 Normal saliva contains abundant hydroxyapatite. Salivary stasis and ductal inflammation promote aggregation of mineralized debris to form nidus, which ultimately leads to the formation of calculi. Recurrent episodes of salivary colic with pain and swelling at mealtimes are the common symptoms of salivary calculi. This is explained by obstruction of salivary flow which is intensified during mealtime. The rate of the enlargement of a salivary calculus is approximately 1 to 1.5 mm annually.9 For this reason, sialolithiasis may remain asymptomatic for a long duration until there is a significant obstruction of the salivary flow. 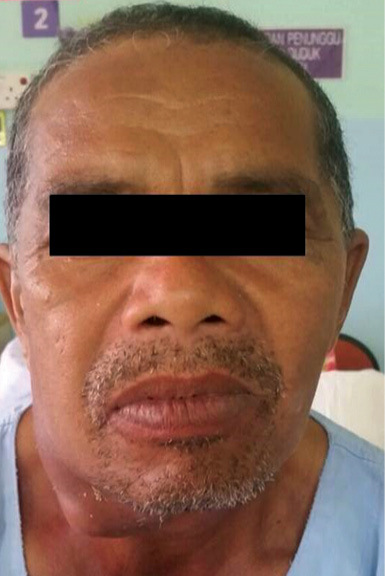 The patient might also have a history of multiple episodes of acute suppurative sialadenitis. Some will experience xerostomia and occasionally the sensation of a gritty, sand-like foreign body in their mouth. Persistent sialolithiasis leads to stasis of salivary secretion. This predisposes the gland to recurrent inflammation and infection, which might cause ductal atresia and stricture. Acute suppurative sialadenitis or abscess formation is not uncommon in sialolithiasis, as observed in our case. Treatment of sialolithiasis is based on the location and the size of the calculi. Small calculi may benefit from conservative management. Hydration, moist heat, sialogogues, and gentle massage of the gland towards the ductal opening may promote spontaneous expulsion of the calculi.4 If the salivary gland shows signs of infection, prompt antibiotic coverage should be given. A small calculus found near the orifice of salivary duct may also be removed after widening of the orifice with a lacrimal probe.1 Submandibular calculi located close to the orifice of the Wharton duct can be removed by marsupialization. This is considered as the best surgical option whenever the calculus can be removed intraorally. An incision is made over the calculus to allow removal. More proximally located calculi can be removed by interventional sialoendoscopy with wire basket extraction. 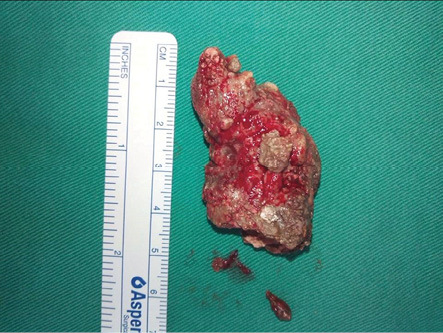 Larger calculi embedded in the gland causing symptoms require surgical excision of the gland. Alternative treatment options for sialolithiasis include extracorporeal shock wave lithotripsy (ESWL) and, more recently, endoscopic intracorporeal shock wave lithotripsy (ISWL).13 In these methods, piezoelectric lithotripter is used to deliver a shock wave and reduce calculi to small fragments that are then flushed out of the duct with spontaneous salivation or the use of secretagogues. Sialolithiasis is common and should be considered in patients with submandibular swelling and pain especially at mealtimes. GSGC are encountered rarely. Some cases of GSGC might be asymptomatic. However, long standing salivary stasis predisposes the gland to recurrent infection, which can lead to ductal stricture or atresia. Despite the availability of modern treatment methods like ESWL and ISWL, surgical removal remains the mainstay of treatment for GSGC. 1. Lustmann J, Regev E, Melamed Y. Sialolithiasis. A survey on 245 patients and a review of the literature. Int J Oral Maxillofac Surg 1990 Jun;19(3):135-138. 2. Bodner L. Giant salivary gland calculi: diagnostic imaging and surgical management. Oral Surg Oral Med Oral Pathol Oral Radiol Endod 2002 Sep;94(3):320-323. 3. Ledesma-Montes C, Garcés-Ortíz M, Salcido-García JF, Hernández-Flores F, Hernández-Guerrero JC. Giant sialolith: case report and review of the literature. J Oral Maxillofac Surg 2007 Jan;65(1):128-130. 4. Williams MF. Sialolithiasis. Otolaryngol Clin North Am 1999 Oct;32(5):819-834. 5. Hiraide F, Nomura Y. The fine surface structure and composition of salivary calculi. Laryngoscope 1980 Jan;90(1):152-158. 6. J Rogers, TV McCaffrey. Cummings Otolaryngology-Head and Neck Surgery 5 Ed. Elsevier Health Sciences; 2010; 1155. Raksin SZ, Gould SM, William AC. Submandibular duct sialolith of unusual size and shape. J Oral Surg 1975 Feb; 33(2):142–5. Rai M, Burman R. Giant submandibular sialolith of remarkable size in the comma area of Wharton’s duct: a case report. J Oral Maxillofac Surg 2009 Jun;67(6):1329-1332. 7. Alkurt MT, Peker I. Unusually large submandibular sialoliths: report of two cases. Eur J Dent 2009 Apr;3(2):135-139. 8. Patil S, Sharma S, Prasad LK. Sumandibular megalith with erosion of floor of mouth. A rare case report. World Articles in Ear, Nose and Throat 2009 May [cited 2015 Sept]. Available from: http://www.waent.org/archives/2009/vol2-2/giant-salivary-gland-stone/giant-salivary-gland-stone.htm. 9. Zakaria MA. Giant calculi of the submandibular salivary gland. Br J Oral Surg 1981 Sep;19(3):230-232. 10. Yoshimura Y, Inoue Y, Odagawa T. Sonographic examination of sialolithiasis. J Oral Maxillofac Surg 1989 Sep;47(9):907-912. 11. Iro H, Schneider HT, Födra C, Waitz G, Nitsche N, Heinritz HH, et al. Shockwave lithotripsy of salivary duct stones. Lancet 1992 May;339(8805):1333-1336.